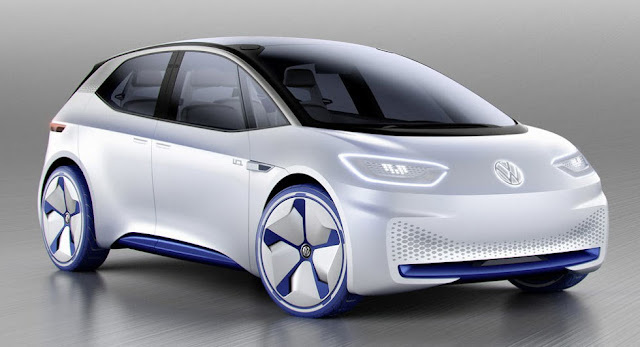 Volkswagen's Chief of Corporate Strategy has revealed the production version of the ID concept will costs thousands of dollars less than the Tesla Model 3. According to Automobil Produktion, Thomas Sedran used the Automobil Forum to announce the Volkswagen ID will undercut the Model 3 by $7,000 to $8,000. Considering the latter car starts at $35,000 that would mean the ID could have a base price as low as $27,000. The price isn't official at this point as Sedran is counting on battery prices to drop significantly by the time the car launches. As he explained, lithium-ion batteries currently cost between €150-200 ($172-229) per kilowatt hour but he expect that number to drop to less than a €100 ($114) per kilowatt hour in the future. Originally unveiled at 2016 Paris Motor Show, the ID concept previews a production model that will be launched in 2020. The concept rode on the MEB platform and had an electric motor that produced 170 PS (125 kW). This enabled the car to accelerate from 0-100 km/h (0-62 mph) in less than eight seconds before hitting a top speed of 160 km/h (99 mph). More importantly, the model could travel between 400-600 km (248-372 miles) on a single charge. 0 Response to "Volkswagen ID Could Cost $8,000 Less Than The Tesla Model 3"